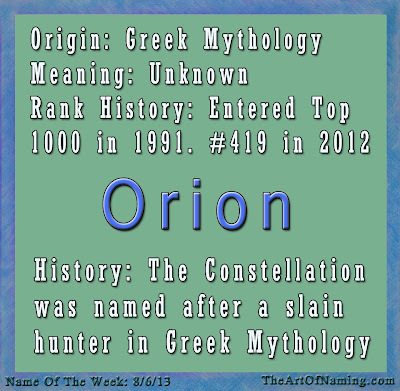 Our "Fan of the Week" Kiira chose a super cool girl's name straight out of Norse Mythology. Love it! The name is Eir. 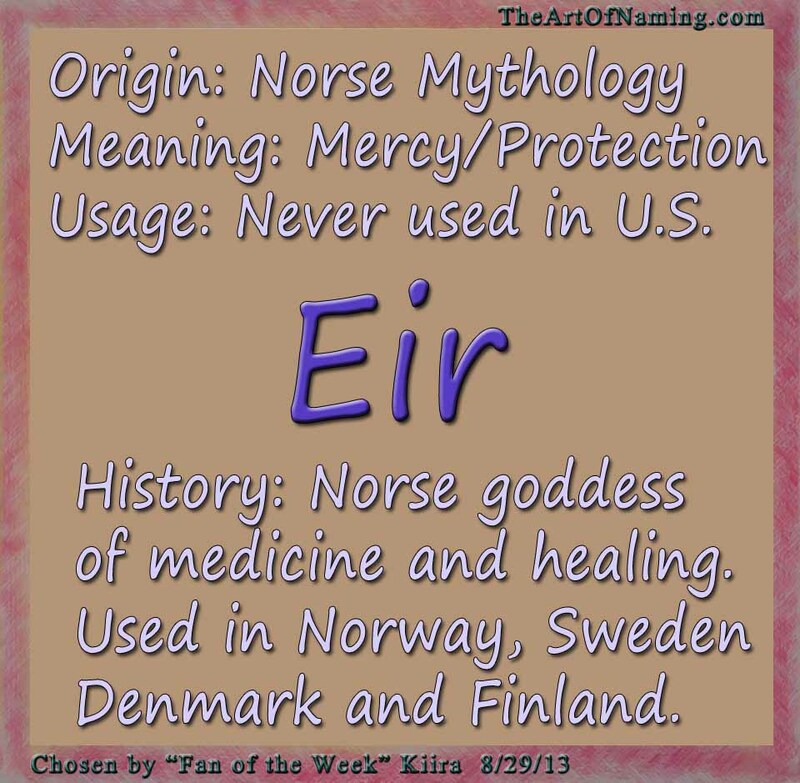 Eir was a Norse goddess of healing and medicine. 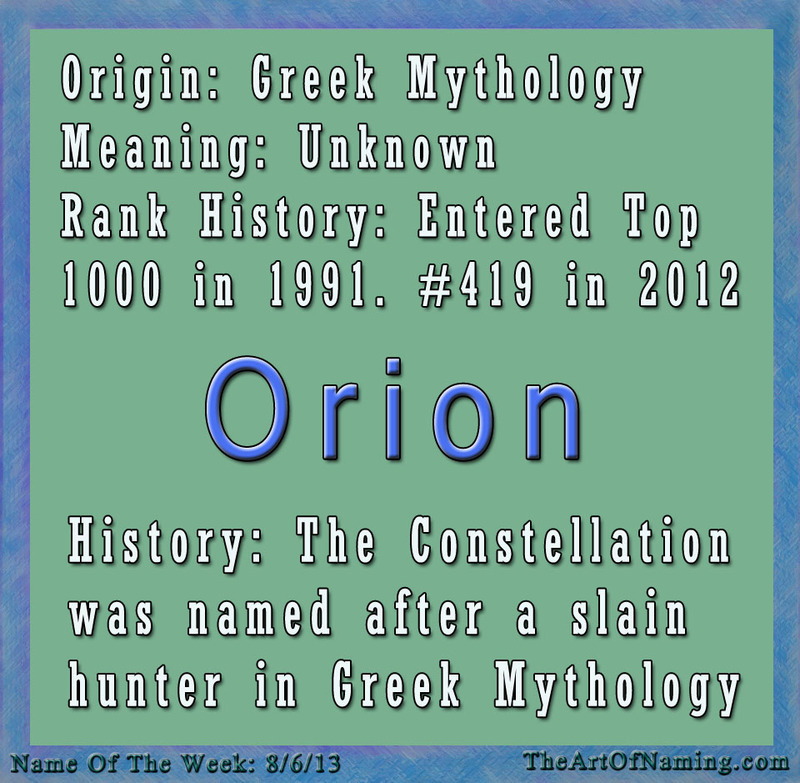 The name means "mercy" or "protection, help" in Old Norse. 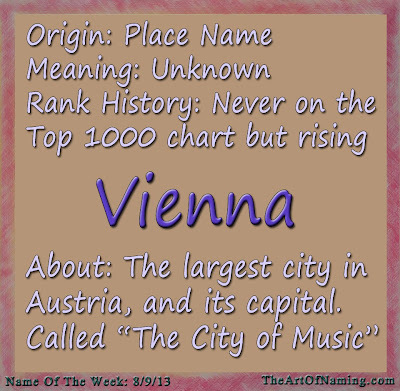 If you're wondering how it is pronounced, you can listen to it here. To my ear, this Icelandic pronunciation almost sounds like "ayvf." 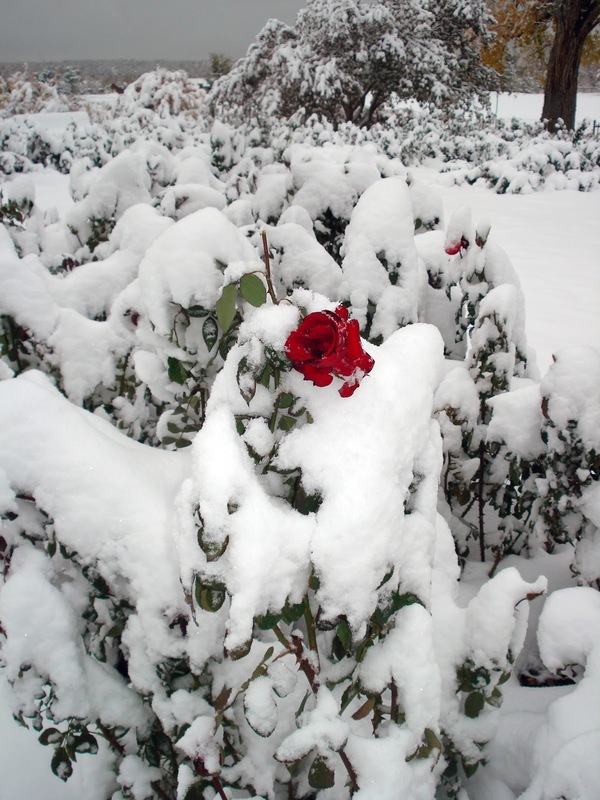 I've also heard it said sort of like "air" on a character in the video game "Guild Wars 2," Eir Stegalkin. 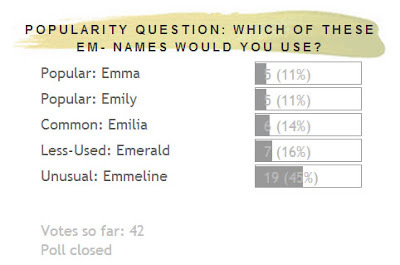 No matter how you may pronounce it, this name is rare. And I mean RARE. 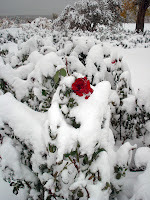 Upon researching the number of births that Eir has had in the US, well, the results came back "No matches were found." Aha! Nobody in the States has ever used this name. 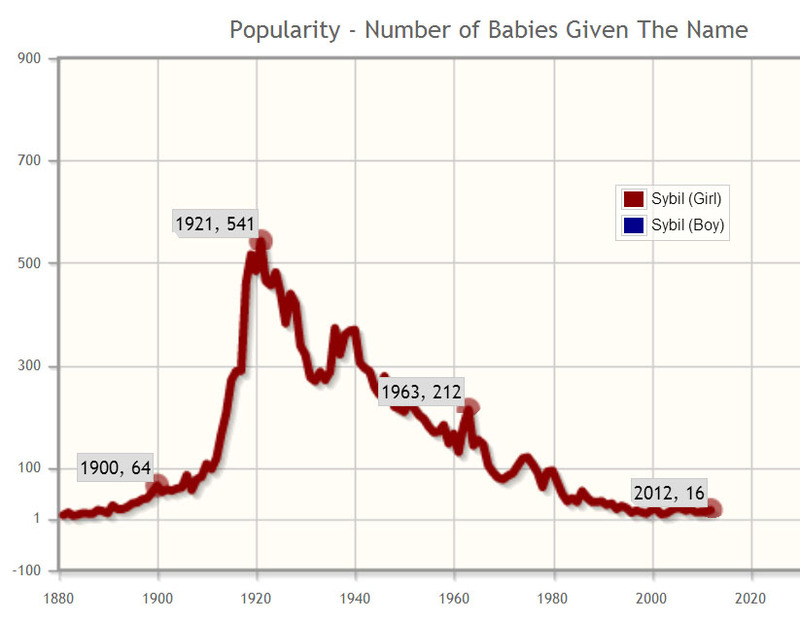 Well, at least not the minimum requisite of 5 babies per year in order to be recorded. Despite these statistics, there's actually quite a bit of information on the name on Wikipedia, which mentions poetry and prose. Read it if you'd like! Norway: 130 females if counting both the first and middle names. Sweden: 30 females, including middle names. 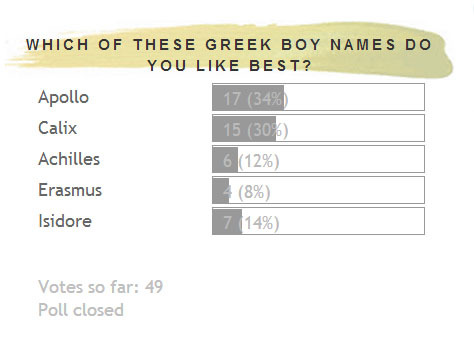 Sweden: 3 males had it as a middle name. 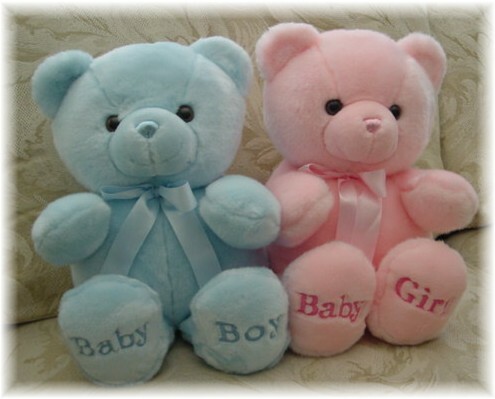 Finland: 5 female and 5 male middle names. In Finland, records show that there have been less than 25 males and less than 25 females who have ever had the name since 1899. Interesting! 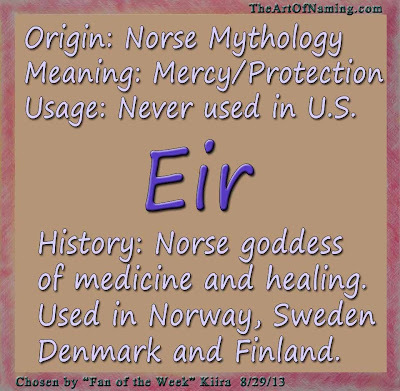 Eir is definitely a rare name all around. While I love the idea of it, I'm pretty sure it won't work very well on a modern American child, but only because of pronunciation issues. It is definitely cool and unique otherwise. What do you think of this "buried treasure" of a name? Do you have any guilty pleasure names that you totally love but will probably never use? I think Eir is on my list now. 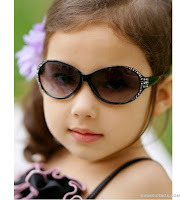 Girl name beginning with either W, P or Q.
Feminine but does NOT begin or end with a vowel. Avoid the Top 100 names. Longer first name with a one syllable middle name. 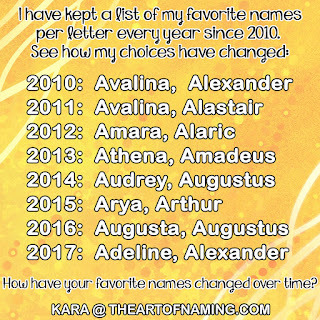 Middle name cannot start with an A. The last name is also one syllable. 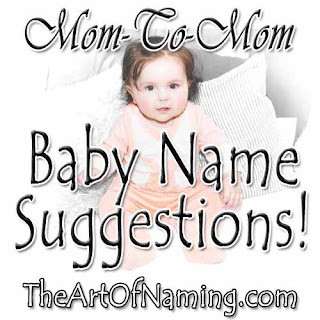 Right now, the priority is to find a name that ends with a consonant sound that mom and dad can agree on. Their naming styles seems to differ. He likes common and classic whereas she is a bit more adventurous. 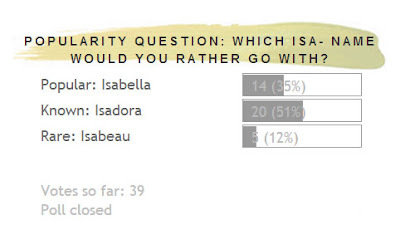 They have two children with somewhat classic names, but she is not concerned at all about finding a name to "match". What other names would you suggest? I've sent plenty of options and am waiting for another reply once she has a chance to talk with her husband but I thought I'd open this up to all of you name-lovers and see what ideas we can compile for her! P.S. 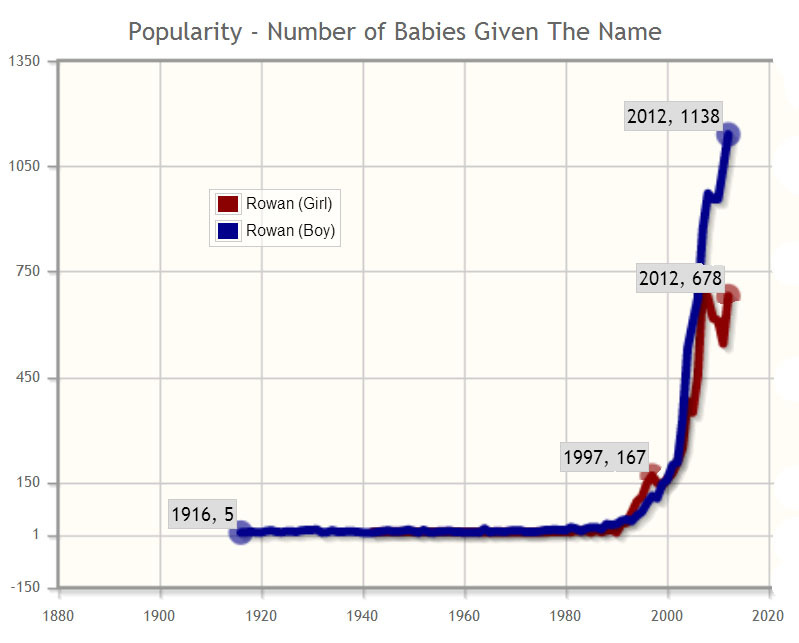 If you have a baby naming dilemma too, check out this page. 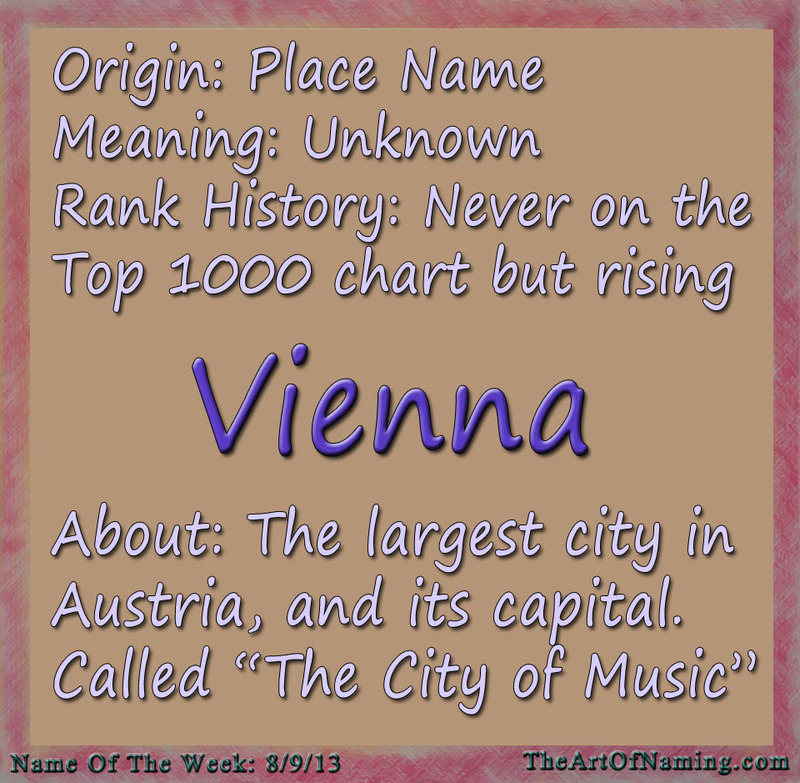 Our first "Fan of the Week" contest winner was a woman named Kiira who chose two interesting European names! I will feature the girl's name next Thursday. The boy's name is Kinnon. 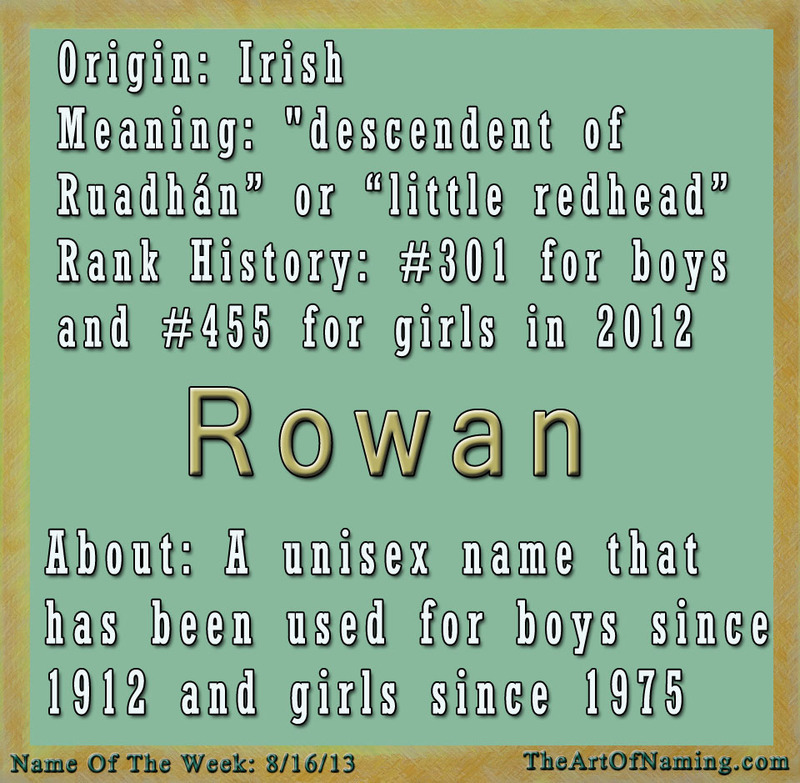 It is a Scottish name that originated as a Gaelic surname. 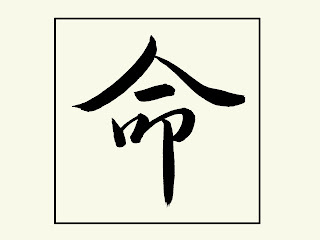 It comes from the name Mac Fhionghuin which means "son of the descendant of the well born". The source was a bit confusing, but I believe it was first recorded in 728 a.d. as Mac Fhionghuin. Over time, the name has had many different spellings. One of the first recorded spellings of this family name was on a man named Lachlann Makfingane in 1409. After that came Fingonivs, and it evolved to M'Fynwyn around 1490, Makfingoun in 1560, and then Kynnane in 1587. The spelling McKynnoun was around in 1621, McKinin came in 1680, and by 1781 it was typically spelled MacKinnon. Other variations include McKinnon, MacKinning, MacInnon, MacKinnen and MacFingon. 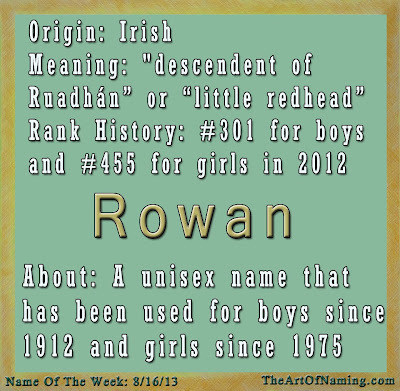 As a baby name, it is said to mean "fair born". 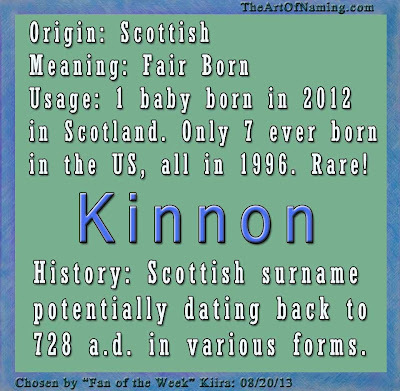 Interestingly, there was only one baby born in Scotland in 2012 with the name Kinnon. 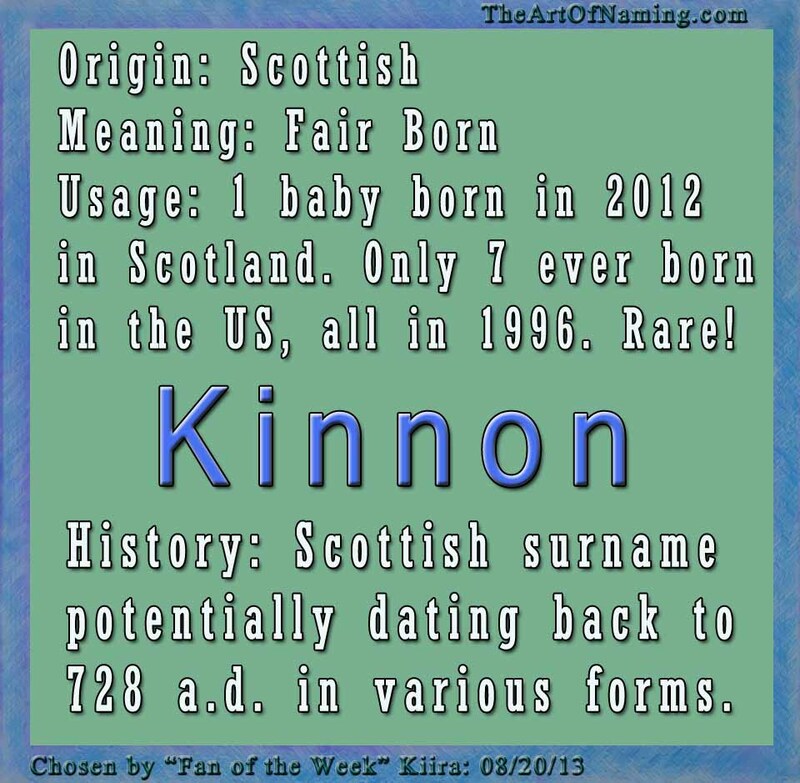 In the US, Kinnon is virtually unheard of! 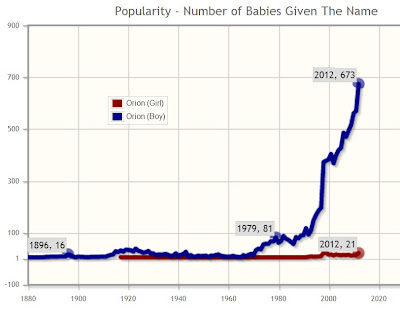 There have only been 7 babies on record who were given the name and they were all born in 1996. Keep in mind that the record covers 1880-2012. What do you think of this rare name? I love that its not only rare in the US but it's rare in Scotland where it originates! Thanks again, Kiira, for suggesting the name! In honor of my post featuring "cool girl names," the Girl's Name of the Week is a lovely Greek name that means "prophetess". With the recent popularity of the TV show Downton Abbey, the name of the Crawley's youngest daughter has been on the minds' of American parents. Sybil was nearly forgotten until now, but it doesn't appear to be climbing back up the charts just yet. Sybil was not originally a name, but an ancient Greek word for a woman who claimed the ability to foresee that which most people could not. These prophetesses were thought to have divine knowledge and were revered. 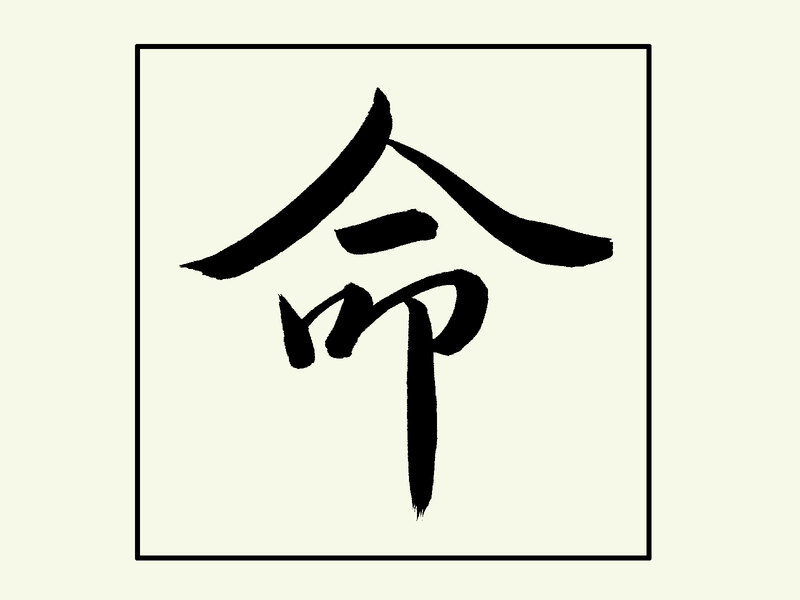 Despite its origins as a word, the name itself its uniquely beautiful. 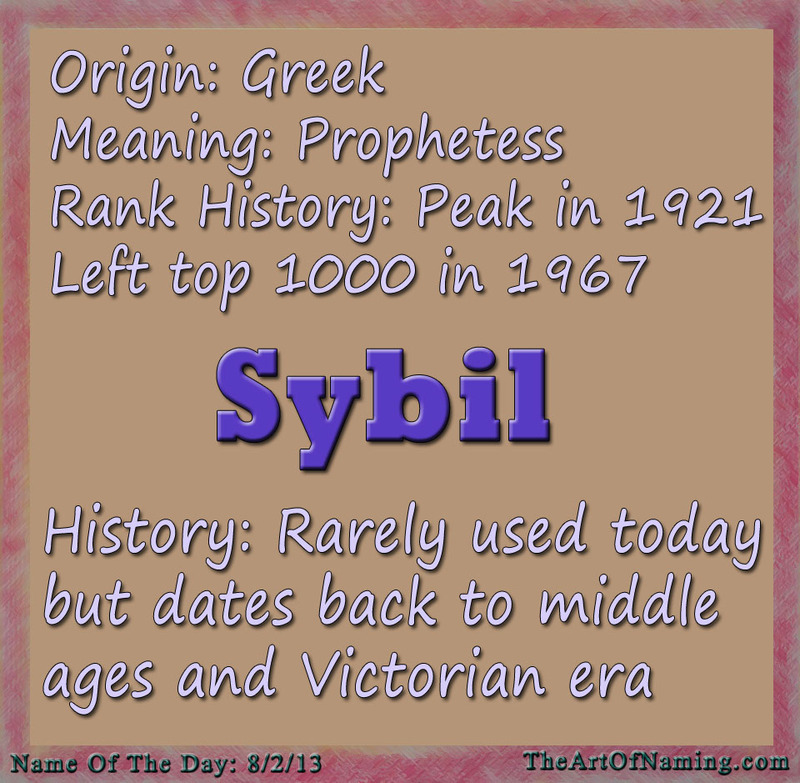 It can also be spelled Sibyl or Cybill, and there are many international variations such as Sibylla or Sybille. 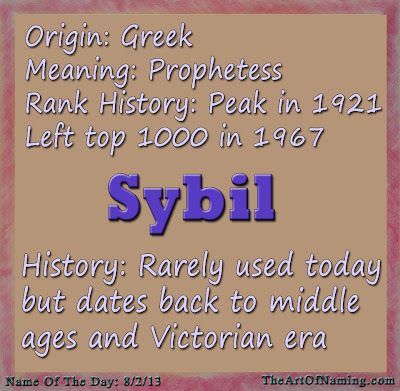 This spelling, Sybil, has been around since the middle ages where it saw common usage among Christians. It was later taken to England by the Normans but became extremely rare after the Protestant Reformation. It wasn't until Benjamin Disraeli wrote a novel titled "Sybil" in 1845 that the name saw a revival through the Victorian era. 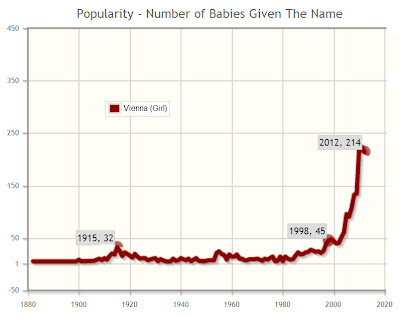 This name peaked in usage in 1921 when 541 baby girls were born. 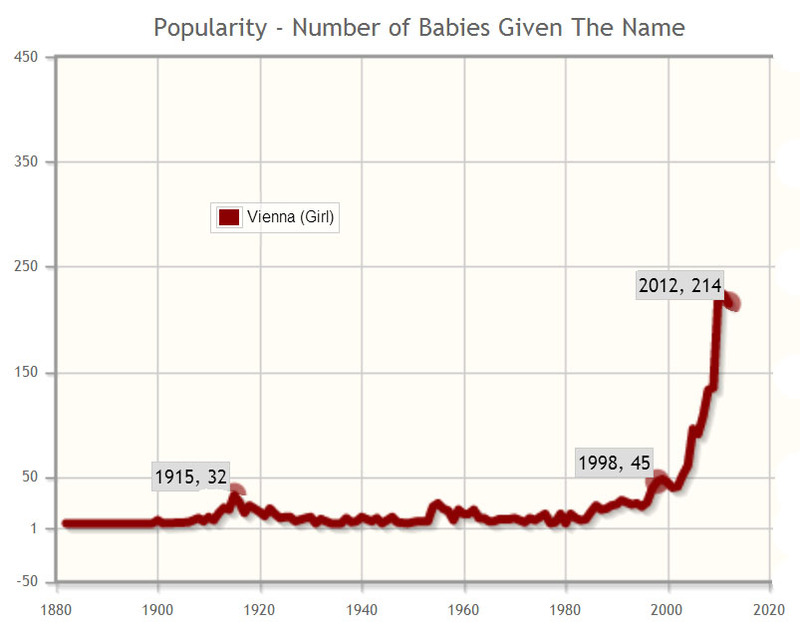 Since then, the name has declined greatly and fell off of the Top 1000 chart in 1967. In 2012, there were only 16 babies given this name, ranking it at #7706. Lady Sybil from Downton Abbey had the middle name Cora after her mother. Sybil Coraline? Sybil Caroline? Her sisters are named Mary and Edith. Do you think Sybil has the potential to regain some popularity? Or do you think its strong meaning makes parents shy of using it? Do you like the name? Let me know in the comments section below!